Hill's Prescription Diet Canine/Feline a/d gives your cat or dog all the nutrition they need while they recover from an accident, surgery or serious illness. Your pet needs extra nutrition while they get over a traumatic event like surgery, an accident or a serious illness. They need lots of nutrients and plenty of energy to help them heal and to get their immune system back on track. Hill's Prescription Diet Canine/Feline a/d is designed for this, and also has a yummy taste and soft texture to encourage them to tuck in. The soft texture is really good for syringe, spoon or hand-feeding your pet if they can't make it to their bowl. The amount you feed your pet will depend on what they're recovering from and how much they weigh. Your vet will be able to give you advice on feeding schedules. The food isn't right for animals who need to avoid fluid retention or high levels of phosphorus and sodium. it's also not good for pets that have an intolerance for fatty food, for example animals with (or at risk from) pancreatitis. nutritious – can be your pet's only food source. The recipe is high in calories and fat so that your pet gets all the energy they need to get back to their old selves. It's high in protein so that your pet's muscles stay strong and to help wounds heal faster. It gives a boost to the immune system too. The recipe contains extra potassium to stop blood potassium levels dropping too low. This can cause muscle cramps, especially if your pet’s already in a bit of pain during recovery! Omega-3 fatty acids soothe pain and reduce swelling. Best of all, the formula is easy to digest. Your pet's digestive system has less strain on it so they’ll get every last drop of nutrition. Veterinary diets like this one have been specially made to support pets with specific medical conditions. Because of this, they might not be suitable for all pets, so we'd recommend getting professional advice before feeding them to your pet. If you think your cat or dog could benefit from eating Hill's Prescription Diet Canine/Feline a/d, why not have a chat with your vet? Please consult your vet for further information and guidance on what is best for your pet. By purchasing Hill's Prescription Diet Canine/Feline A/D you confirm your pet has been examined by a vet who has recommended the use of this food on the basis of examination and diagnosis. You understand it is recommended while your pet is being fed Hill's Prescription Diet Canine/Feline A/D, you seek veterinary advice at least every 6 months regarding the usage of this food and the on-going care of your pet. 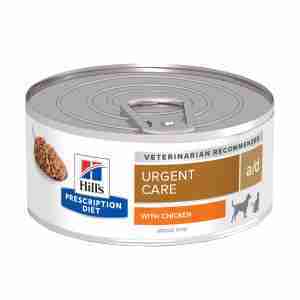 Should your pet's condition deteriorate in any way while using Hill's Prescription Diet Canine/Feline A/D seek immediate veterinary advice. Water, turkey liver, pork liver, chicken, turkey Heart, corn Ffour, pork protein isolate, fish oil, calcium carbonate, chicken liver flavour, egg flavour. Protein 10.3%, fat 7.8%, crude ash 2.2%, moisture 76.5%. Always make sure that your pet has access to plenty of water. This was recommended by my vet - it's what they use to build cats up when they are convalescing. My cats love it as it has a strong smell and is full of flavour. I can even sneak some of the ProDen teeth cleaner in it (which they won't eat any other way. I also add a bit of water to it, which helps hydrate them. recommended by my vet and has kept my little cat healthy and happy post toxoplasmosis for the last three years. She is now 19!! She won't eat anything else. I have a cat who has stomach issues and this is the only food she can eat , thankfully she is happy and healthy eating this. Not having to go the vet for it every time helps a lot . When she would not eat anything the vet suggested this, and she ate it. If she could talk and tell me why, I'd know why. Now she's back on her usual food but I always have a few tins of this in the cupboard.